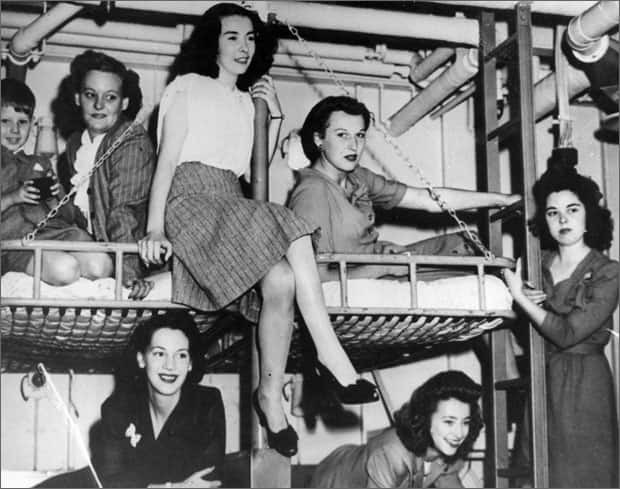 During World War II, the family dynamic in Canada changed as fathers and brothers went off to fight in the war while the women were left to not only tend to the children, but also take over occupations typically held by males. As children were more or less left in the dark, the rise of comics provided Canadian children with a new source of entertainment. 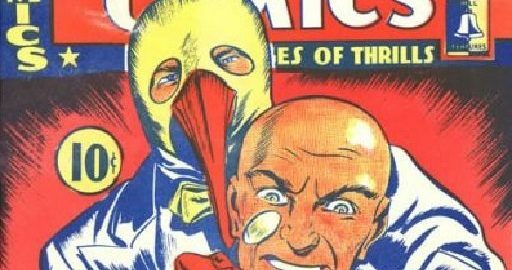 The comics illustrated different super heroes and plots based around the war at the time. Most of these stories included crude stories or depictions of events that helped the children to better understand what was going on without revealing too much for them to worry. In retrospect, the comics are a very good distraction to these kids. 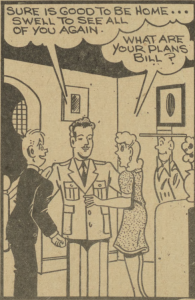 However, looking at the comics now as young adults, we can clearly see the crude humor of racism, and the facts of the war are displayed throughout these comics. In my comic, Wow Comic Issue. 16, there was one comic in particular that illustrated crude humour towards Indigenous people specifically. The specific comic I will be looking at is the “Jeff Warring” comic that uses the character of an Indigenous man and native setting to represent the Indigenous people in a certain way. The research question I will be analyzing will be: How are the Indigenous People displayed in the comics? I believe that this comic displays Indigenous people as inferior to European Canadians, which in turn makes the audience perceive them in a different way. By using the simplistic language and illustrations of the comic, I will be able to show the difference between both characters. This topic will not only shed some light on how First Nations were seen as, but also give some perspective against stereotypical beliefs. Over the years, the First Nations of Canada have been characterized in a certain way that depict stereotypes and representations that are false, usually made by European Canadians. as inferior to European Canadians. In some comics, the Indigenous people are seen as doctors, business people and other higher positions in occupations (Dither and Larsen, 2010). This shift of representations displays how Indigenous people helped out in the war, even though this is rarely shown in history. On the contrary, there is one example where the comic displays the Indigenous person in more of a popular demand than the European Canadian character. The comic examines a Native hero, Big Chief Woohoo. 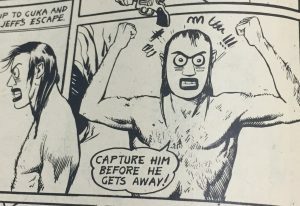 Originally, he first appeared alongside a European Canadian hero named Gusto, however soon after Big Chief Woohoo, got the lead role in his own comic. 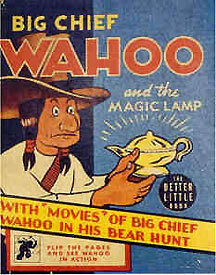 Although, in this perspective, the Indigenous character was seen as superior over the European Canadian characters, the reasoning why Big Chief Woohoo became so popular was because of pop culture’s stereotypical approach towards Indigenous people. It is noted that “He fit the role of the ignorant savage” (Breen 2005) and much of the reason he became so popular is because the author made him ignorant to technology. This is a great example of the use of using illustrations and simplistic language to help depict a character. The only reason his character became a favorite to the audience is because of the crude humor and illustrations that made him seem inferior to a white character like Gusto. “You couldn’t find a better example of the ignorant savage than Wahoo. Besides the language cited above, the way he wrote letters in pictures, and his attempts to ride a car like a horse.” (Breen, 2005). Even though, Big Chief Woohoo, is seen as superior to Gusto, he only became popular because his character lacked knowledge that supposedly more European Canadian’s have. 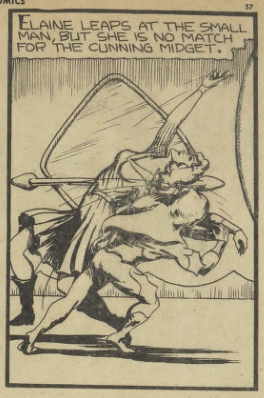 The illustrations in the Jeff Warring comic specifically, reflect this approach in the differentiation of both races. Stereotypes in Appearance: What Do You Think? Chief is made to look non appealing, with features that get overlooked. 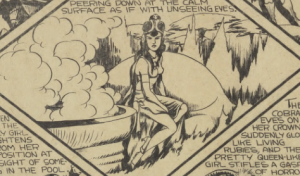 When looking at the comic now, the reader can see that the illustrations tend to favour the appearance of a stereotypical Indigenous persona, and also display stereotypical movements in the illustrations of how they would have acted. This misinterpretation and inappropriate facts used against Native Americans shifts the audience’s perception on how they are viewed. Comic books, specifically a part of Pop Culture, details the prominence of anti-Indianism in comic books, particularly as means through which Euro-American authors and audiences have made claims on and through Indianness (King, 2008). The audience when viewing the comic, takes the illustrations of the comic and reads in between the lines and perceives in a way that makes sense to them. For example, if the Chief is displayed with a racial appearance that goes with the stereotypes, as seen in the picture below, then the audience will see the Indigenous Chief in that manner because it was handed to them. These illustrations prove that our perceptions are made based on what the media shows us. In particular, the media and general sources, such as Encyclopedia’s and news documents, only display the negative aspects of the Indigenous people’s history and their war efforts as well. Are the Media and the Government the Real Culprits? seen that there could be a romantic association with Jeff Warring and the Chief daughter, Tana, who is the main female character apart of the comic. 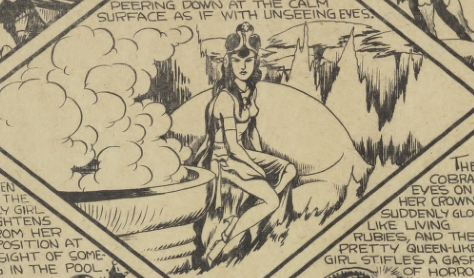 However, looking at the comic through the lens of a researcher, you can observe that the relationship between Jeff Warring and Tana is submissive and dominant. Tana’s character goes against her own father, to help Jeff Warring escape and fight against her own kind. This can be related to the events of a women named Dorothy Chartrand, who was a part of the Metis tribe and had to be a service woman because her husband joined the war. In this journal article, she recounts her experience and the reasons she joined, as well as how she was treated and discriminated for her race. Her “grandmother’s teachings about oppression and its operation in the lives of Métis” in which she described the role of government to take away “your pride, your dignity, [and] all the things that make you a living soul. When they are sure they have everything, they give you a blanket to cover your shame” (Iseke and Leisa, 2013). They explain how even though their efforts were purely voluntary and not paid, the government still discriminated against them. This point in time, really shaped the lives of these women and were a critical point for these Indigenous women. The character Tana was stripped of everything, and aided Jeff Warring. In relation to the mass media, pop culture makes it so that when we perceive it as an audience, we see it as two characters falling in love, when in actuality it has a deeper meaning that children reading these comics will not understand. Children at a young age reading these comics take that interpretation and bring the stereotypical information with them into their adolescent and adult years. To conclude, there is a very big separation between European Canadians and Indigenous Canadians that an observer can see in the comic and in reality. In particular, to the Jeff Warring comic story in Wow Comics, we can see this relationship when looking at both illustrations and speech bubbles that are in the comic issue. 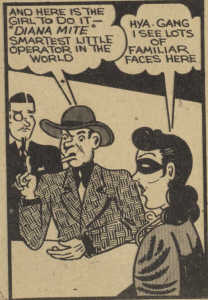 The speech bubble’s that the Chief uses is more simplistic language, whereas the European Canadian, Jeff Warring uses more terminology that can make the audience see the superior and inferior complex between both characters. The illustrations are used to make Jeff Warring appealing to the eye, whereas the Chief is the latter, which creates an image in the audience’s head of what Indigenous people are supposed to look like. The audience can take note that the mass media and government play a huge role in how we interpret Indigenous people. Due to the fact that there are no records of Indigenous people which makes people have a lack of knowledge when it comes to the topic. 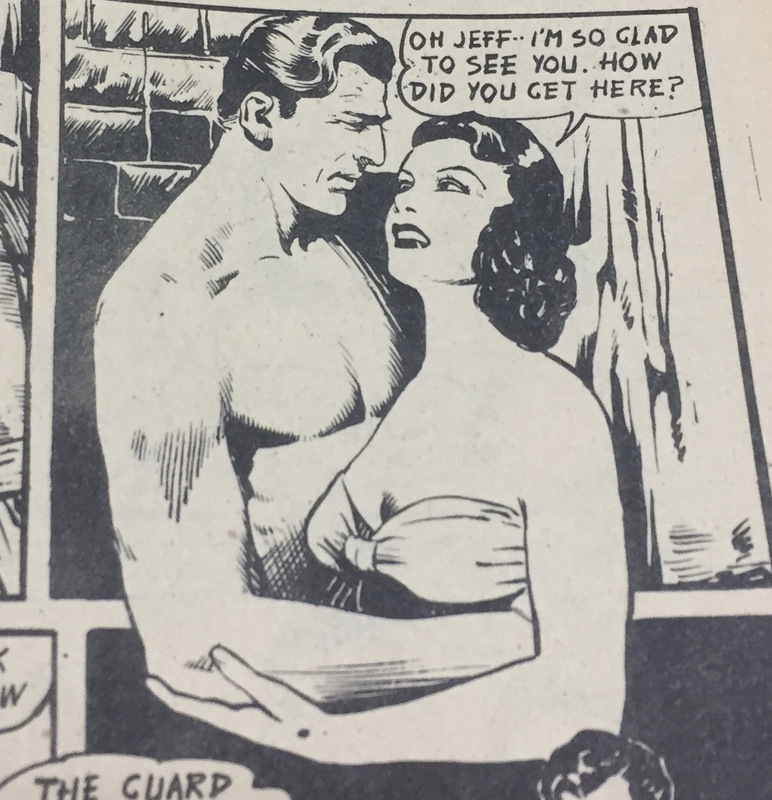 As well, the observer can notice that the relationship between women and government, is related to Jeff Warring and Tana, which can seem to be romantic when in actuality it is something far greater. In result, with the use of illustrations and simplistic language in the comic, we can see the meaning behind the superior and inferior relationship between European and Indigenous Canadians. Indigenous people are seen to be inferior, that even with the efforts of being portrayed in a comic, popularity will always be predominant for the European Canadian. Dither , Jason, and Soren Larsen. “Originality and the Arctic North in Canadian Nationalist Superhero Comics, 1940-2004.” Originality and the Arctic North in Canadian Nationalist Superhero Comics, 1940-2004, 2010. Judy, Iseke M., and Desmoulins A. Leisa. “Critical Events: Metis Servicewomen’s WWII Stories with Dorothy Chartrand .” The Canadian Journal of Native Studies, vol. 33, no. 2, 2013, pp. 29–54. Canadian Business & Current Affairs Database. King, C. Richard. “Alter/Native Heroes: Native Americans, Comic Books, and the Struggle for Self-Definition.” Cultural Studies â Critical Methodologies, vol. 9, no. 2, 31 Dec. 2008, pp. 214–223., doi:10.1177/1532708608330259. Breen, Kevin. “Native American Heroes in the Comics: An Overview (Part 1).” Blue Corn Comics — Native American Heroes in the Comics: An Overview (Part 1), Blue Corn Comics, 28 Sept. 2005, www.bluecorncomics.com/kbreen.htm.